With a foreword by Eric Metaxas, best-selling author of Bonhoeffer and Amazing Grace. The enthralling biography of the woman writer who helped end the slave trade, changed Britain's upper classes, and taught a nation how to read. The history-changing reforms of Hannah More affected every level of 18th-Century British society through her keen intellect, literary achievements, collaborative spirit, strong Christian principles, and colorful personality. A woman without connections or status, More took the world of British letters by storm when she arrived in London from Bristol, becoming a best-selling author and acclaimed playwright and quickly befriending the author Samuel Johnson, the politician Horace Walpole, and the actor David Garrick. Yet she was also a leader in the Evangelical movement, using her cultural position and her pen to support the growth of education for the poor, the reform of morals and manners, and the abolition of Britain's slave trade. 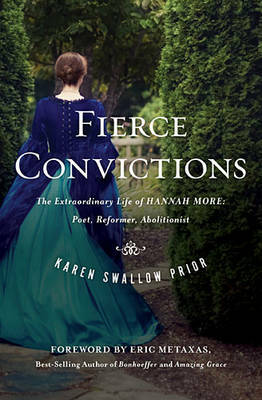 Fierce Convictions weaves together world and personal history into a stirring story of life that intersected with Wesley and Whitefield's Great Awakening, the rise and influence of Evangelicalism, and convulsive effects of the French Revolution. A woman of exceptional intellectual gifts and literary talent, Hannah More was above all a person whose faith compelled her both to engage her culture and to transform it.